The Apocalypse at a hands reach. Patricia Veri and Diego Martínez are an Argentinian couple of international art traffickers. Jaques Roan, a French billionaire, hires them to steal the Codex Calixtinus from the Cathedral of Santiago de Compostela in Spain; the codex is a 12th century manuscript whose content has always been a motive for pilgrimage for hundreds of believers. Diego and Patricia easily grab the codex due to its lack of protection, despite its economic and historical value. They realise that the codex contains the Gospel of St. James the Greater, encrypted with a medieval technique. In the text of one of Jesus' favourite disciples, is revealed data about his genealogy that could mean a dramatic collapse in the Christian faith: It denies the virginity of Mary, the divinity of Jesus and his eternal relationship with the Holy Trinity. For Diego and Maria, this text can mean great accumulation of wealth, but for the Vatican it will mean something very similar to what they know as the Apocalypse. RELEVANT DATA: The novel was written in just five months and sold more than 80,000 copies in the first semester after its publication. It is inspired by a real case, where the Codex housed in the Cathedral of Santiago appeared in the garage of an electrical worker. 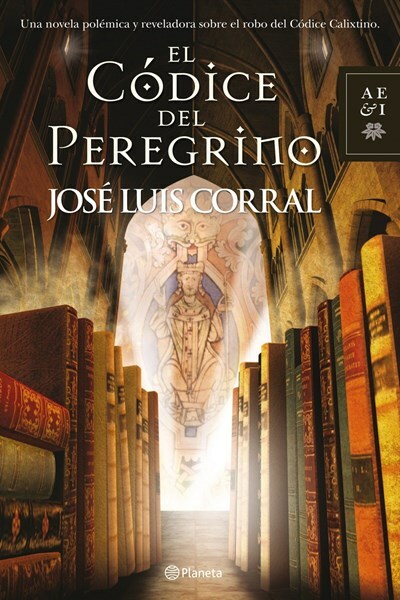 Corral is considered to be "the master of the contemporary Spanish historical novel", and his novels have been highly praised and translated into several languages. He is one of the most prestigious international historians in Spain, becoming the historical advisor to Ridley Scott for his film 1492: Conquest of Paradise. THEMES: Theft, Crime, Codex, Encrypting, Discovery, Search for Truth, Religion, Power, God, Vatican, Secrets, History, Apocalypse.